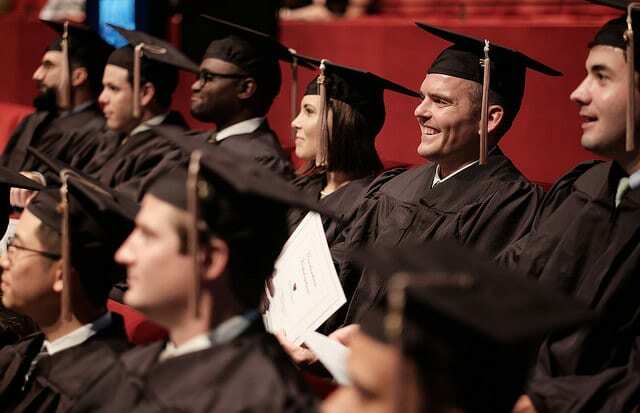 WINSTON-SALEM, N.C. –Fifty-eight working professionals earned their MBA degrees from Wake Forest University School of Business after completing a two-year evening program at the Wake Forest University Charlotte Center. They were honored during a graduation celebration Friday, Sept. 25 at Bank of America Auditorium. The Charlotte Evening Class of 2015 honored adjunct professor Mark A. Johnson with the Outstanding Educator Award. The Academic Distinction Awards went to Benjamin Judson Conine, Catherine Brooke Conrad, Mark Adam Guthrie, Lindsay Dixon McNabb, Katherine Marie Nygren and Maureen Elizabeth Sterbling. Tara Elizabeth Poole Hostetter received the Student Leadership Award. The graduates include: Jared Larry Antczak, Matthew Kyle Arnold, Forest Lee Banks, Kevin Matthew Battista, Jason Matthew Benoit, Aubrey Blair Campbell, Benjamin Judson Conine, Catherine Brooke Conrad, Stephen Trent Corbin, Tushar Murlidhar Dabhade, Bradley Russell Divins, Charles Eccles Elliott, Jr., Laura Elizabeth Faust, Andrew John Fischer, David Bean Fisher, Jr., Michael Andrew Freelove, Lester Jerard Giles, Thomas James Groner, Mark Adam Guthrie, Jason Patrick Handley, Alfonso Harding, Jr., Fritz Hjardemaal, Derrian Lamar Hollingsworth, Tara Poole Hostetter, Tiffany Nicole Jenkins, Tyson Jarrell Jeter, Matthew Price Johnson, Sherwin Yuang Kao, Jowita Kiernozek, Robert Joseph Kozak III, Andrew David Lester, Patrick Sean McDonough, Kelsey Hazel McKillop, Lindsay Dixon McNabb, Robert Drake Mellon, Jennifer Dawn Muckley, Ananthanarayanan Nilakantan, Katherine Marie Nygren, Zachary Patterson Pittman, Rene Gustavo Ramirez, Doreen Astrid Suzanne Whitley Rogers, Adji Fatou Abdou Seck, Maret Decker Seitz, Sharadendu Kumar Singh, Dustin Woodard Stancil, Maureen Elizabeth Sterbling, Kevin Scott Stewart, Royce Rosario Syracuse, Brittney Summerlin Taylor, Alex Kenneth Teal, David Alexander Truesdale, Jacob Robert Velky, Tyler David Weir, Sarah Pearce Wetenhall, Leonard Lamont Williams, Drew Michael Wozniak, Andrew Michael Zancanaro.